There’s a bold new star on the horizon and when it finally bursts into full view later this year it will be the culmination of the biggest truck testing and development program ever undertaken by Mercedes-Benz in this country. Replacing the existing Actros range, the aggressively styled line-up of new Mercedes-Benz heavy-duty trucks will have undergone more than three years and one million kilometres of intensive testing in preparation for life in our fiercely demanding and hugely diverse market. Details of the new line-up and the exact number of models slated for the initial onslaught in the last quarter of this year are for the moment being kept close to the chest, but from all appearances, Daimler Australia is taking absolutely nothing for granted in its bid to put the Benz brand back on the front line in the highly competitive cab-over class. 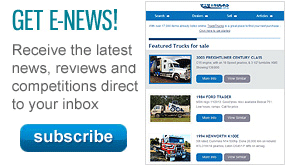 Trade Trucks can, however, at least confirm there will be narrow and wide cab versions in several roof heights, in 4x2, 6x2, 6x4, and 8x4 configurations, catering for everything from metropolitan and regional distribution roles to top-weight road train work. Even though this new Mercedes-Benz breed first broke cover in Europe in 2011, there was wisely no rush to release the range here. Instead, there has been a quiet, carefully crafted development process that started in 2014 with the determined intention to ensure every element of the new trucks was thoroughly tested under Australian conditions before being launched. As Mercedes-Benz insiders quietly concede, the last thing anyone wants is a repeat of the problems that dogged early Actros models following its Australian launch in 1998. 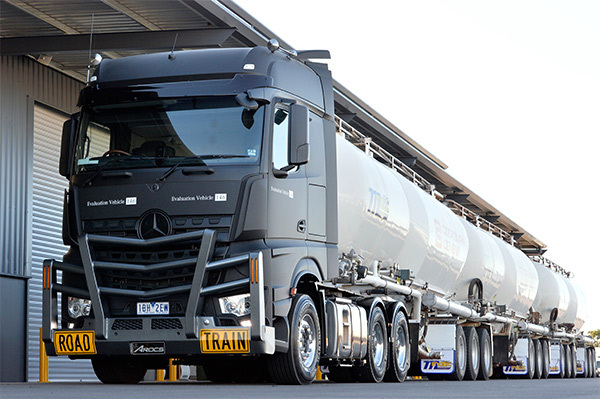 With nothing being left to chance, there’s even deliberation within Daimler Australia on whether the Actros name will be carried over to the new line-up. The Mercedes-Benz heavy-duty range will target everything from local distribution work right through to roadtrain triples roles. Within the Daimler world, the new model project is referred to as SFTP – Strategic Future Truck Platform, tying together the massive cab, engine and drivetrain platforms developed progressively over the past decade for Daimler’s worldwide truck business. Consequently, we can confidently predict the new Mercedes-Benz line-up will use all four of the six-cylinder displacements (8, 11, 13, and 16 litres) from Daimler’s multi-billion dollar HDEP (heavy-duty engine platform) engine family in a mix of Euro 5 and Euro 6 versions. It is, of course, the same engine family which spawned Detroit’s DD15 and in the new Mercedes-Benz range will effectively bring to an end the V6 and V8 engines which have been part and parcel of Benz architecture for more than three decades. Daimler’s ‘PowerShift 3’ automated 12- and 16-speed transmissions are almost certain to be standard in the majority of models. 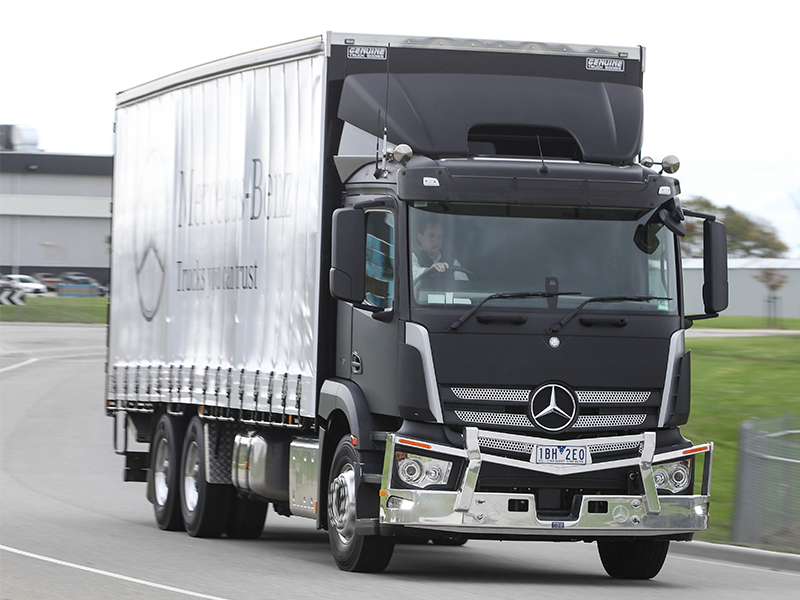 While Daimler Australia will continue to offer cab-over contenders from North America (Freightliner Argosy) and Europe, it appears the great hope is that the new Benz will be quickly established as a leading, high-profile competitor, laying the foundation for Daimler’s long-term ascendancy in the fiercely competitive heavy-duty cab-over class. As Michael May, director of Mercedes-Benz Truck & Bus, remarked, "This is Mercedes-Benz’s return to a truly competitive place in the market. "It is a completely new start, free of the connotations of the past and the timing is exactly right." Cabs will come in narrow (pictured) and wide versions with a range of roof heights, and engine displacements from eight to 16 litres. 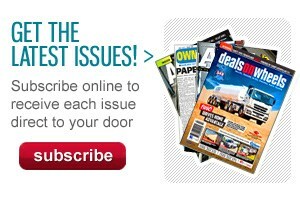 For now, Benz executives are keeping further details close to the chest. Meantime, Mercedes-Benz Trucks national sales manager Andrew Assimo says everything about the development and testing process is unique to Australia. "This is a major undertaking by Mercedes-Benz to fully understand and appreciate the needs and demands of the Australian market," he explained. "Germany is fully committed to this project and we have more trial units here than anywhere outside Europe." There are now 15 units under evaluation in everything from triple road trains to line-haul B-doubles, regional and metropolitan distribution, and others being used as training platforms for sales and service departments, and for body and componentry enhancements. Importantly, up to 35 operators from a wide range of applications have been involved in the development and testing program to date. 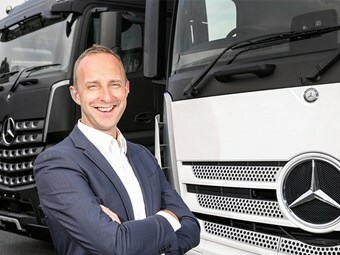 On the all-important question of weight distribution, particularly over the front axle which has been such a historic bugbear for V8-powered Actros models, an adamant Andrew Assimo says the greater length of a six-cylinder engine – combined with the new model’s shortened front axle to bumper dimension of 1400 mm – provides a distinct advantage in weight dispersion over current V8 trucks. "We’re in a better position than ever before," he concludes.